The Gladiator Accessory Starter Kit will kick start your Gladiator garage storage system. 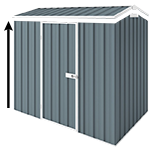 Gladiator Garageworks products are designed to provide you the best organisation solutions for your garage or workshop. The Gladiator Accessory Starter Kit will kick start your garage Gladiator storage system. Please note this does not include the tools and Gladiator Geartrack Channels which they attach to. So if you don’t have tracks already you can shop for them HERE. Please note Gladiator products will be shipped separately to shed kits if part of an order. Gladiator Garageworks products are home delivered. You will see shipping cost in your cart.